(Szeszko et al. 2005), autism (Barnea-Goraly et al. 2004), HIV-AIDs (Pomara et al. 2001; Ragin et al. 2004), and Fragile X (Barnea-Goraly et al. 2003). In nearly all cases, diffusion anisotropy (e.g., fractional anisotropy - FA) is decreased and diffusivity increased in affected regions of diseased white matter relative to healthy controls, while the reverse is true for healthy white matter in development (FA increases, diffusivity decreases). It is important to note that diffusion anisotropy does not describe the full tensor shape or distribution. This is because different eigenvalue combinations can generate the same values of FA (Alexander et al. 2000). So, for example, a decrease in FA may reflect a decreased major (largest) eigenvalue and/or increased medium/minor (smallest) eigenvalues. FA is likely to be adequate for many applications and appears to be quite sensitive to a broad spectrum of pathological conditions. However, changes simply indicate some difference exists in the tissue microstructure. Several recent studies have looked more directly at the diffusion eigenvalues to determine if they can provide more specific information about the microstructural differences. The results have suggested that the eigenvalue amplitudes or combinations of the eigenvalues (e.g., the radial diffusivity, Dr = (X2 + X3)/2) demonstrate specific relationships to white matter pathology. For example, the radial diffusivity appears to be specific to myelination in white matter (Song et al. 2005), whereas the axial diffusivity (Da = Ài) is more specific to axonal density, making it a good model of axonal degeneration (Song et al. 2002). Tensor shape can be fully described using a combination of spherical, linear and planar shape measures (Alexander et al. 2000; Westin et al. 2002), which may also be useful for understanding WM pathology. Consequently, it is important to consider alternative quantitative methods when trying to interpret DTI measurements. The diffusion tensor is a good model of the diffusion-weighted signal behavior for low levels of diffusion weighting (e.g., b < 1500s/mm2). However, the diffusion tensor model does not appear to be consistently accurate in describing the signal behavior for higher levels of diffusion-weighting (e.g., b > 2000 s/mm2). The problems with the simple diffusion tensor model arise from two sources -(1) apparent "fast" and "slow" diffusing components (Mulkern et al. 1999) that cause the signal decay with diffusion-weighting to appear bi-exponential; and (2) partial volume averaging (e.g.,Alexander et al. 2001a) between tissue groups with distinct diffusion tensor properties (e.g., crossing white matter (WM) tracts, averaging between WM and gray matter tissues). The fast and slow diffusion signals are likely to arise from local restriction effects from cellular membranes although some have hypothesized that these signals correspond to intra- and extra-cellular diffusion. The effect of partial volume averaging causes ambiguities in the interpretation of diffusion tensor measurements. Whereas the diffusion anisotropy is generally assumed to be high in white matter, regions of crossing white matter tracts will have artifactually low diffusion anisotropy. Consequently, in regions with complex white matter organization, changes or differences in diffusion tensor measures may reflect changes in either the tissue microstructure or the partial volume averaging components. As the diffusion-weighting is increased, the profiles of apparent diffusivity reveal non-Gaussian diffusion behavior in voxels with partial volume averaging. A growing number of strategies have been developed for measuring and interpreting complex diffusion behavior. The methods vary in their acquisition sampling and analysis approaches. For all of the approaches described here, increasing the maximum diffusion-weighting will improve the characterization of both the slow diffusion components and the partial volume effects, although the measurement SNR will be decreased. where Df and Ds are the fast and slow diffusion tensors, and k is the signal fraction from the fast compartment. For a fixed diffusion encoding direction, the signal decay appears bi-exponential with diffusion-weighting. Bi-exponential strategies are appropriate for the cases where there is no significant partial voluming expected and when the diffusion may be modeled using a combination of narrow and broad Gaussian distributions. As discussed earlier, partial volume effects (e.g., crossing WM fibers) will significantly complicate the interpretation of fast and slow diffusing components. In addition, the assignment of these components has been controversial. 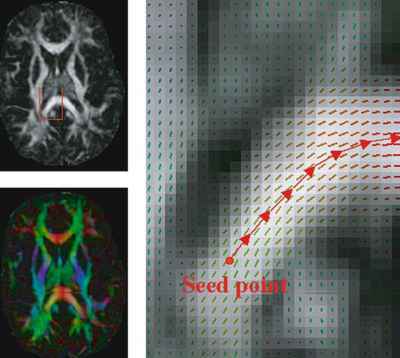 High Angular Resolution Diffusion Imaging (HARDI): In order to better characterize the angular diffusion features associated with crossing white matter tracts, several diffusion encoding approaches have been developed that use a large number of encoding directions (Ne > 40 up to several hundred) at a fixed level of diffusion-weighting(Alexander et al. 2002; Frank 2002). Although HARDI studies have been reported with diffusion-weighting as low as b = 1000 s/mm2 (Alexander et al. 2002), the separation of tract components will be much better for higher diffusion-weighting. The original HARDI methods estimated the profiles of apparent diffusion coefficients and used spherical harmonic decomposition methods to estimate the complexity of the diffusion profiles (Alexander et al. 2002; Frank 2002). Higher order spherical harmonic basis functions represent signal terms that may correspond to crossing white matter tracts in the voxel. Odd spherical harmonic orders do not correspond to meaningful diffusion measurements and are generally assumed to be noise and artifacts. The HARDI 3D diffusion profiles may also be modeled using generalized diffusion tensor imaging (GDTI) (Ozarslan and Mareci 2003; Liu et al. 2004) which use higher order tensor statistics to model the ADC profile. The GDTI methods proposed by Liu et al. (2004) demonstrate the impressive ability to model asymmetrically bounded diffusion behavior, although the method requires the accurate measurement of the signal phase, which is nearly always discarded and may be difficult to obtain in practice. One problem with these approaches is that in the case of crossing white matter tracts, the directions of maximum ADC do not necessarily correspond to the fiber directions. estimated by integrating several measurements together, the SNR of the ODF will be much higher than that of the ADC values in the original HARDI. The derivations of q-space formalism assume that the widths of the diffusion-pulses, 5, are narrow relative to the pulse spacing, A, such that 5 << A. The maximum gradient amplitudes on current clinical MRI systems cause this assumption to be violated for diffusion spectrum imaging, since 5 ~ A. The effect of this will be to slightly, but consistently underestimate the diffusion displacements, but the overall distribution shape will be correct (Wedeen et al. 2005). Note that relationship of DSI (q-space) to diffusion tensor imaging is that P(R, A) is a multivariate Gaussian and the diffusion-weighting factor is b = |q|2 (A — 5/3) or b ~ |q|2A for small 5. The DSI approach yields empirical estimates of the distributions of diffusion displacements (e.g., model free), which are described using the standard definitions of Fourier sampling theory. Note that this definition of ODF (Eq (9)) for DSI is derived differently for DSI than it is for QBI (Tuch 2004). Alexander (2005) demonstrated that the concentric q-space shell samples in hybrid diffusion imaging (HYDI) could be used for DTI, DSI and QBI in the same experiment. Applications of High Diffusion-Weighting: The complexity and time required to perform advanced diffusion imaging methods with high diffusion-weighting has limited the number of clinical and research studies relative to the work in diffusion tensor imaging. The pathophysiologic significance of fast/slow diffusion measurements is unclear. Only one published study to date (Brugieres et al. 2004) has specifically examined the effects of pathology (ischemia) on the fast and slow diffusion components. Several small studies of hybrid DSI methods have shown promise in being sensitive to white matter changes associated with multiple sclerosis (Assaf et al. 2002a; Cohen and Assaf 2002), autoimmune neuritis (Assaf et al. 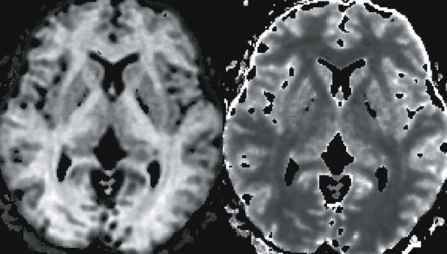 2002b), and vascular dementia (Assaf et al. 2002c). Clearly, more studies are necessary to justify longer imaging times than DTI. To date, none of these methods have been used to directly investigate the relationships to brain connectivity. In addition to providing information about the mean diffusivity and anisotropy, diffusion imaging methods can also yield novel information about the orientation of local anisotropic tissue features such as bundles of white matter fascicles. 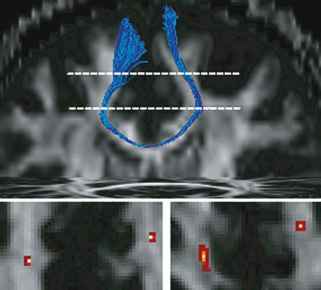 In diffusion tensor imaging, the direction of the major eigenvector, ei, is generally assumed to be parallel to the direction of white matter. This directional information can be visualized by breaking down the major eigenvector into x, y and z components, which can be represented using RGB colors - e.g., Red = e1x =Right/Left; Green= e1y =Anterior/Posterior; Blue= e1z =Inferior/Superior. Maps of WM tract direction can be generated by weighting the RGB color map by an anisotropy measure such as FA (Pajevic and Pierpaoli 1999). For many applications, the use of color labeling is useful for identifying specific WM tracts and visualizing their rough trajectories. An alternative strategy is white matter tractography (WMT), which uses the directional information from diffusion measurements to estimate the trajectories of the white matter pathways. WMT increases the specificity of WM pathway estimates and enables the 3D visualization of these trajectories, which may be challenging using cross-sectional RGB maps. where r(T) is the path and vtraj is the vector field that defines the local path direction. Typically, streamline WMT algorithms use major eigenvector field to define the local trajectory directions vtraj = e1 at each step (Conturo et al. 1999; Mori et al. 1999; Basser et al. 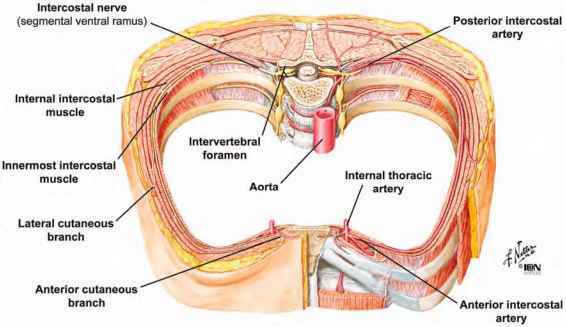 2000) (see Fig. 10). Alternatively tensor deflection (TEND) vtraj = Dvin uses the entire diffusion tensor to define the local trajectory direction (Lazar et al. 2003). The integration of deterministic pathways may be performed using simple step-wise algorithms including FACT (Mori et al. 1999) and Euler (e.g., Ar = vtraj Ax) (Conturo et al. 1999) integration, or more continuous integration methods such as 2nd or 4th order Runge-Kutta (Basser et al. 2000), which enable more accurate estimates of curved tracts. where E is a factor related to the diffusion tensor encoding scheme and the diffusion tensor orientation, and j = 2, 3. Further, the tract dispersion is also affected by the local divergence of the tensor field (Lazar et al. 2003). Even in the complete absence of noise and image artifacts, most current deterministic methods cannot accurately map WM pathways in regions with crossing or converging fibers, which has led to the development of visualization tools to highlight these regions of uncertainty (Jones 2003; Jones et al. 2005c). An alternative approach, recently tested in visual cortex, is likely to be most applicable for mapping interhemispheric fibers. In this method, rather than placing seed voxels in regions of high coherence (e.g., splenium of the corpus callosum), the two hemispheres were seeded separately. Only those obtained tracts that overlapped in the corpus callosum were considered to be valid tracts (Dougherty et al. 2005). This method produced anatomically plausible results for projections from primary visual cortex, but the authors cautioned that many tracts were likely missed, due to the low specificity of WMT and the resolution of current DTI acquisition protocols. New diffusion imaging methods such as DSI and QBI described above are capable of resolving regions of white matter crossing and may ultimately improve WMT in regions of complex WM. (Ciccarelli et al. 2003a), and cortex (Rushworth et al. 2005) according to patterns of maximum connectivity. were first identified using probabilistic tractography for individual subjects in native image space. The individual subject data were then resampled into a standardized space, using the b = 0 images as the reference image (Ciccarelli et al. 2003b). Similar dispersion occurs if FA maps are resampled instead of tract probabilities (Jones et al. 2002a). The large variability across subjects away from tract centers raises the possibility that when correlations of FA and some behavioural or functional measure are found at tissue interfaces, that they may arise simply from the increased variability in FA in these regions. Many published results of voxel-based assessment of group FA differences or FA correlations have identified significant effects in regions of more variable FA. 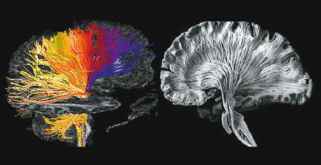 These tend to be located at interfaces of white matter with gray matter or CSF (as seen on Ti-weighted images), or in regions of complex fibre architecture. An example of one such finding is shown in Fig. 14, where correlations of FA with performance on a working-memory task were strongest at tissue interfaces. Because of the error introduced by imperfect registration, residual noise from flow artifact and partial volume effects, as well as the application of smoothing filters (see below), most authors have interpreted such findings with caution. In fact, similar concerns prompted one group to abandon a preliminary voxel-based analysis for one using tractography to define ROIs in the corpus callosum (Kanaan et al. 2006). Results seem to be more robust to these noise sources if mean tract FA is used rather than voxel-wise FA. An example is seen in recent work examining structure-function relations in the visual system (Toosy et al. 2004). In this study, dispersion was also seen in optic radiations, and it increased as more liberal thresholds were used to define connectivity (Fig. 15, left panel). However, since the regions of high overlap (red) dominated mean FA in the optic radiations, the magnitude of the correlation of FA with the BOLD response in visual cortex was not affected (Fig. 15, right panel).